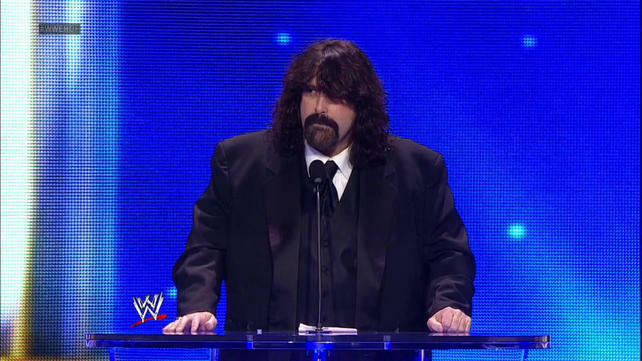 On January 11 2013, WWE.com announced that Mick Foley would be inducted into the WWE Hall of Fame on April 6, 2013 in New York City –the night before WrestleMania XXIX — and would be inducted by his long time friend Terry Funk. During his induction speech, Foley talked about his days in the gym (which he admitted that not a lot of working out took place), how his family learned through his mannerisms when he was thinking about a promo, and his biggest regret in his professional wrestling career: the fact that he never…EVAAAAAAAAAAR…pinned Chris Jericho. Next Next post: The BEST Vince McMahon Impression EVAR! !